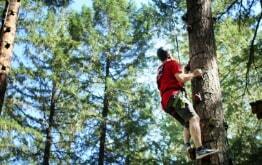 Explore six self guided aerial obstacle courses set high in the trees. Feel the rush of our zip lines! Our staff will harness you in and send you racing through our zip line park. Our team will design a program tailor-made for your organization. Experience what it’s like to climb 40’ straight up a tree. Race a friend on our tandem zip lines! Climb to a platform 65’ in the air and take a leap of faith. For our youngest adventurers, 2-8 years old. 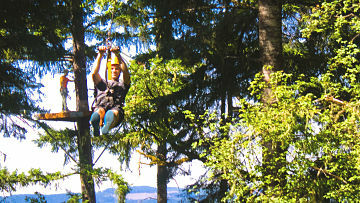 Tree to Tree Adventure Park in Gaston, Oregon, offers a variety of outdoor activities for a fun-filled day trip or an exciting and solidifying corporate retreat. 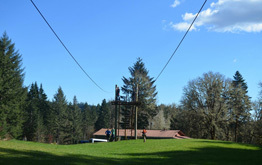 Situated in a beautiful forest located at Hagg Lake, our aerial adventure park is much more than a high ropes course. We offer a wide range of aerial activities to accommodate all ages and skill levels, so everyone can feel comfortable during their adventure in the trees. Move from tree to tree using platforms and obstacles on our aerial playground of wobbly bridges, tightropes, balance beams, over 14 interspersed zip lines and more, all set high in the trees. We offer self-guided aerial obstacle courses. Strap in and experience our thrilling zip line canopy tour that includes a 1,280-foot-long super zip. Enjoy breathtaking views of Hagg Lake, the surrounding forests and nearby mountains on an adrenaline-pumping excursion you won’t soon forget. Racing Zip Lines: Race your friends on tandem zip lines. 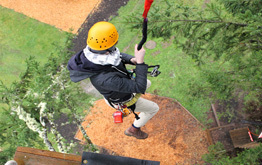 Tree Top Plunge: Climb up a 65-foot platform and take a leap of faith. Monkey Grove: Climb 40 feet straight up a tree like a monkey. 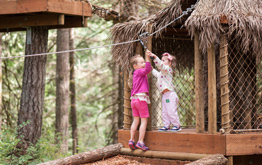 Adventure Village: Suitable for the youngest adventurers, ages 2-8. Create your own adventure! Choose an aerial obstacle course and zip tour combo to enjoy both main attractions or select a package deal to save on any combination of your favorite adventures. Purchase the Aerial Obstacle Course Triple Play or Zip Line Triple Play and add two of three extra adventures. Choose from the racing zip lines, Tree Top Plunge or Monkey Grove. Get a full day of adventure that includes all five park attractions with the All Adventure park pass. We offer unique team-building activities to help your group of students or adults identify and improve weaknesses while establishing and building on strengths. Our facilitation team understands the value of "team" and will design tailor-made programs to ensure your team meets all its desired goals. If you are ready to experience the ultimate in adventure and luxury, our Zip, Sip, & Stay package is a great choice. Along with your Tree to Tree adventure, you will receive a deluxe suite as well as wine tastings, gourmet lunches, and an array of specials at local restaurants. Reservations are required and available on a first-come, first-served basis. Book yours today using the "BOOK NOW" link above or contact us at (503) 357-0109 with any questions. Thank You for signing up! You've been added to our email list.